It’s time to hit the road for your motorcycle vacation or perhaps a night away with a friend. Packing a motorcycle has always been a challenge due to the obvious lack of stowage availability and the need to ensure it endures the elements. But that’s the fun of it all – getting by with less and finding the right motorcycle touring luggage will make it all the easier! The best mode of packing gear and travel essentials is hard luggage or panniers as is the term. 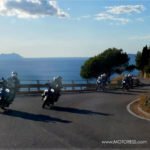 This is the choice among long distance enthusiasts/ true touring riders. These don’t get in the way when riding and have a large capacity including secure locks. Softer luggage options such as tank bags, tail packs and backpacks are also something to consider depending on the length of your journey. There are many variations on soft and hard luggage – so think carefully about what will suit your lifestyle and your budget. Be it hard or soft luggage there are numerous variations within these categories to choose from. The majority of soft luggage available is designed for universal fitments and are usually made from sturdy materials such as canvas, nylon or occasionally leather and usually water-resistant but not water proof. These are great for riders who can pack light or generally ride on during fair weather days. These are also suitable as they’re easy to mount onto any type of motorcycle. 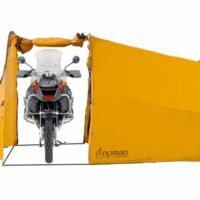 Typically, throw-over panniers and tank bags come in the form of soft luggage, and these can be bungee’d to the luggage rack or passenger seat. Some soft bags have internal frames/supports, usually made of plastic, so that the bag can hold its shape even when it’s not full. The biggest disadvantage of soft cases is they’re generally not waterproof, and will leak! Also, soft luggage is not very secure in the sense of your valuables when parked/stopped and has usually less stowage capacity than that of hard luggage. Why would you purchase it with all these disadvantages? It’s rather inexpensive does have a lot of flexibility being it can fit on most motorcycle models. Hard luggage is rigid in construction and generally comes in the form of panniers and a top box. It is made of a hard plastic or aluminium and is rigidly mounted to your bike with metal or plastic brackets. Hard luggage is expensive, but for good reason- it has a longer lifespan and is entirely waterproof. Plus it has a much larger storage capacity. Hard luggage is also much more secure, both in terms of possible theft and in terms of falling off. 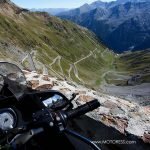 It can be difficult to find hard luggage that fits your bike properly (unless you own a BMW) and it can also be quite tricky to fit the mountings. Tank bags another very popular option making the most of the unused area in front of the rider. Mounted usually by way of strong magnets on the bottom keep them fixed to the tank. Handy to attach and remove! These are great for smaller, softer items and short trips. They are usually expandable too! Handy when you’ve picked up too many souvenirs along the way. Just use caution to ensure the bag doesn’t restrict operation of the controls while turning. Another handy item is a tail pack which sits on the passenger seat. These can be fastened with a bungee cord. Back packs are very popular among solo rider’s especially urban commuters’ as these can carry your laptop or iPad safely without harm. And when riding two up, your passenger can easily wear it. These again are great for shorter journeys but must be properly packed and fitted so they do not cause discomfort (too heavy can restrict movement or fatigue you) or become loose. 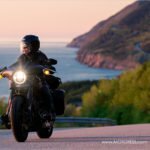 Before making your motorcycle luggage purchase, it pays to think about how much you will need to carry and how often. This will help define your budget and the size/type of luggage best suited for you. Whatever you choose, ensure it will keep contents within dry and secure. Use caution for those ‘good deals’ you might be find the item will not stand up to the task! Follow your manufacturers guidelines on loading your motorbike and that the luggage is fixed to the motorcycle correctly and securely. Load heavy items within your luggage as near to the motorcycle’s centre of mass as possible to reduce adverse effect on handling. Check/adjust your suspension settings and tyre pressures. With added load, just as when carrying a passenger, the handling and performance of your motorcycle can have significant side effects. Carrying any type of luggage on your motorcycle will have an effect on the handling characteristics of the machine – be sure you can manage/handle this. If you find your skills are not up to the task, reduce the items/weight or find another luggage solution such as a back pack. The addition of luggage will increase the width of your motorcycle i.e. saddlebags or side panniers. Try to find luggage that does not exceed the width of your mirrors to avoid problems. Check luggage security regularly throughout your trip. Soft luggage in particular will move around on the motorcycle to a degree and newly fitted parts/carriers can become loose. Have your motorcycle with you when shopping for luggage – you’ll be able to see first hand if it will mount properly. 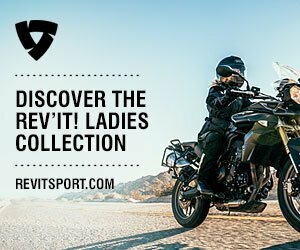 Get advice from your dealer before you buy and try soft luggage on the motorcycle to ensure a firm and secure fit. Take your luggage spare key with you on your trip. A lost key can spoil your trip.